Innovative Smartphone control with different user modes. Bluetooth interface for communication with Smartphone, chest belts for pulse measurements and PC. Device can also be used without Smartphone via basic electronics with count up, count down and pulse programmes. 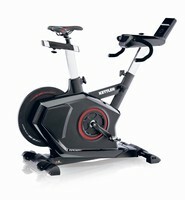 Click the button below to add the Kettler - Racer S Indoor Race Bike to your wish list.